Welcome to Home2 Suites by Hilton Kingman located off I-40 near dining retail and daily conveniences. 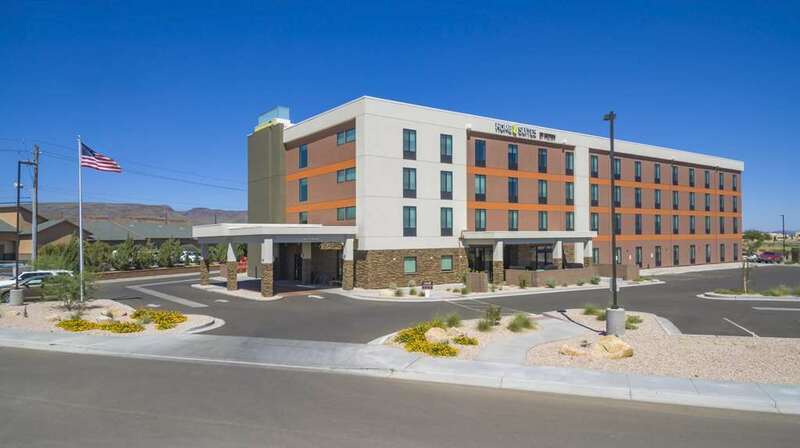 Our all-suite hotel is perfect for medical construction and business travel and we*re close to parks and museums and just 1 mile from Historic Route 66. Enjoy a day trip to the Grand Canyon Hoover Dam or Lake Havasu all an hour to 90 minutes from our extended-stay hotel in Kingman. Feel at home in a studio or one-bedroom suite with plenty of storage areas a work desk and stylish movable furniture to arrange as you prefer. There*s also an in-suite kitchen with a sink refrigerator dishwasher microwave and plenty of cookware plates cups and utensils. Link up to free WiFi and kick back on the sofa watching the 46-inch TV. Home2 is your pet*s home too so bring along your four-legged family. We serve free breakfast at the Inspired Table every morning over 400 possible combinations and the Home2 MKT shop is always open for drinks and snacks. Unwind in our heated indoor pool and whirlpool after a busy day or save time in the unique Spin2 Cycle facility where guests can wash clothes while working out. Our Oasis lounge has work and relaxation covered with a business services area 24-hour coffee/tea service and plenty of cozy seating. Most recently El Palacio was listed among Arizona Highway*s *Best Restaurants 2014* list /April 2014 issue/. *Follow the Firetrucks* was the key to the selection process in 2014. Choose from 7 handcrafted Burgers served with piping hot french fries. We also have hand carved roast beef sliders if a burger isn*t what you*re craving. A solitary Easter Island-type head, out-of-place along fossilized Route 66. Miniatures of the giant head are available in the adjacent gift shop. The real 950-foot-long bridge, moved here from England in the late 1960s. "Terror at London Bridge" was filmed here in 1985; "Piranha 3D" in 2009. Techatticup Mine claims to be the oldest, richest, and most famous gold mine in Southern Nevada. It operated until 1942, and has an estimated $1 million in gold still in it, but it would cost too much to get out. Visitors can tour ghost town buildings and mine. Faithful friend of the dam-builders, and damn dog of the politically correct.